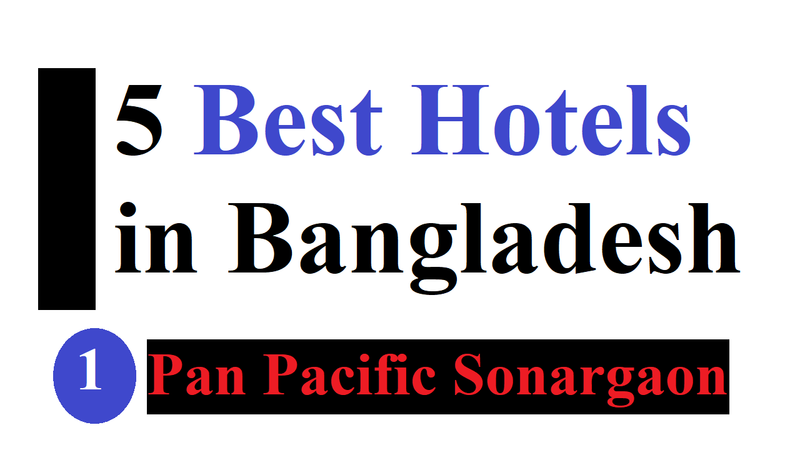 Top 5 Best Hotels in Bangladesh. As we know, Bangladesh has made great efforts in developing the tourism industry with the passage of time. As evidence of the growth of the tourism industry, the growing number of best hotels in Bangladesh, especially, is in Dhaka. However, the metropolitan areas embrace most of the star class luxurious hotels because the urban terrains too are not far behind. If we talk about our country then Bangladesh is a beautiful country with a historic and cultural backdrop. So, the nation offers many luxurious, enjoyable, and world-class five-star hotel options for those who want to travel pursuing these. As a little research reveals that there are many different standards across the world, some are maintained by authorities while some by hoteliers’ associations. But, in the case of Bangladesh context, it’s an important factor to know how many stars a hotel gets is stipulated in the law titled Hotel and Restaurant Rules according to the last amended in 2016. A hotel must meet high standards in 34 different criteria according to the rules to get a five-star rating. And for issuing and monitoring the ratings, the Hotel and Restaurant Cell under the Tourism Ministry is responsible. There are 13 five-star hotels, four four-star hotels and 17 three-star hotels in Bangladesh according to the Tourism Ministry. But, it’s also true that there are allegations against many local hotels that despite don’t meet the standards; they have obtained star ratings nevertheless to increase revenue. On the other hand, some older hotels need renovation to keep up. Also, it’s said that as the Hotel Cell has very little manpower, they have no experts who can assess the hotels in these criteria. So, only two or three hotels would fulfill the criteria of a five-star hotel if judged properly. Other than the rest of the hotels are just three-star levels. And even, as it was lacking in many criteria, the country’s oldest five-star hotel (now InterContinental) is renovating its structure. Moreover, because the hotel building and other facilities were not up to the mark, that’s why many international hotel chains had declined to operate the hotel. According to an official of a five-star hotel, most hotel owners use higher ratings than they are original to raise the hotel’s standing. And this way they charge more on services including food items from the customers. What are the 5 Best Hotels in Bangladesh? Despite the debate, there are many best hotels in Bangladesh. As a result, a lot of tourists are coming and staying with the full satisfaction. Even while leaving they are making good reviews about the hotels that they are staying. These all prove that the situation is not as worse as it’s said in various media. And we’re here to remove this bad propaganda by finding out the best and top hotels in Bangladesh. Well, let’s see what they are who we’re talking about the best Five-Star hotels in the country. One of the best hotels in Bangladesh with high-class luxury and which is the first choice of the stylish traveler. Locating in the center of the city, the Pan Pacific Sonargaon provides breathing space around the concrete jungle by providing green options to its guests. It offers beautiful landscapes are dotted along with swimming pool, spa, and other amenities while providing a welcome feeling to business as well as personal travelers. Also, the hotel provides much more facilities than simple stay with spacious rooms and packages for those who want to roam around the city. All the famous destinations are just around the corner if you prefer to walk around or shop. As it’s making it a very convenient getaway, the international cuisine restaurants in Pan Pacific Sonargaon are the special things worth mentioning. The very first renowned five-star hotel in Bangladesh is Ruposhi Bangla, which was known as Dhaka Sheraton Hotel formerly. Not only the name is changed but the hotel has been remodeled in various contexts. However, as it’s well known for, the new hotel serves its guests with the same care and affection. And people find this hotel as their beautiful home whether is it a business trip or a leisure stay. This hotel’s theme is water as the name itself suggests. This hotel attracts many local and international visitors mainly because of the amazing structural beauty of the hotel, combined with world-class services located at a very convenient place in the Dhaka Airport road. Also, in the purpose of site seeing, shopping, business visits in the city; the hotel is well connected to the important areas. Moreover, it’s serving all kinds of needs of its customers with its seven restaurants and bars. There is a beautiful sport and fitness area that helps the guests stay fresh. Apart from these, the rooms are very spacious with the very best amenities. When they relax in this amazing environment, the internet is provided free of charge to all guests so that they can stay connected. Westin Hotels and Resorts is a new entrant, compared to other five star hotels in Bangladesh. It’s located in Gulshan area of the Dhaka city. It’s started reciprocating with their praise as the guests have seen the value it provides. And the international guests have already been acclaimed this young hotel. It’s not only located in the business district, but it’s also closer to the shopping and relaxation areas around the city. Locating in the airport road of Dhaka, the Dhaka Regency Hotel and Resort is a modern five-star hotel. Along with other facilities as per the international standards, it provides high-class luxurious rooms to its guests. When the guests enter this hotel, they will get everything they need within the campus itself, including a business zone for completing the work in a cool environment. Apart from these, a 24 hours dining room is another major attraction of this hotel. That’s why it’s one of the best hotels in Bangladesh with high-class luxury and which the first choice of the stylish traveler is.